This will be my last post for awhile. I’ll be heading back to university this Monday and having an actual life! When a good little low-carber wants something to snack on, she usually reaches for string cheese, sliced veggies, or a spoonful (or five, in my case) of peanut butter. Packaged diet bars and cookies just won’t do. They fail to satisfy the hunger like whole foods. Scary artificial sweeteners and the polyols that accompany them have very unpleasant side effects. Abstain from the “M” word–MALTITOL–if you have a social life and want to keep it. On top of that, a chewy, dry bar encased in a chocolate vegetable oil coating is a big disappointment to the natural food adapted palette. What’s a hungry health foodie to do? 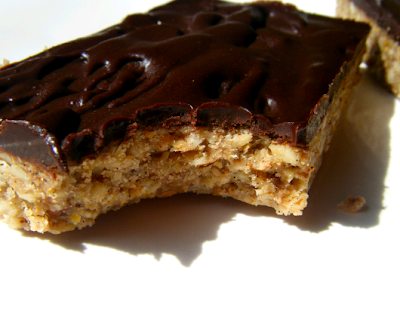 A brilliant gal named Elana came up with a fancy shmancy version of coconut bark, chock full of nuts and seeds, slathered with a blanket of rich chocolate to make your snack time extra special. Spoil yourself rotten with these babies when you can’t look at another cold cut or celery stick. The coconut oil makes them a bit crunchy, tickling your corn chip- and pretzel-deprived taste buds. I cut down on the sugar, de-carbed the chocolate coating, and punched up the flavor with a little twist on the preparation. The testers absolutely flipped for the toasted pecan version. I’d recommend starting there and then following wherever your culinary imagination takes you! There are no hard and fast rules with this wonderfully versatile recipe. One trick to maximize the lovely flavors of these natural ingredients: Toasting, my friend! Don’t be afraid of somehow “destroying the nutrients” in the nuts. Roasting the nuts can actually improve digestibility. I like to think that our tongue is so well designed that it knows what’s best for us, in the same way that it regulates sodium intake. These bars are even more fabulous with the aromatic, slightly smoky flavor that toasting imparts to the nuts and coconut, so don’t skip this step! 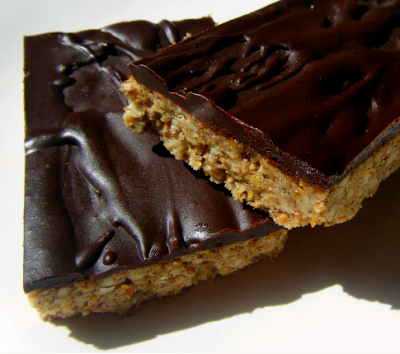 Crunchy and sweet, topped with a layer of smooth dark chocolate! You won’t believe they’re free of sugar and gluten. Promise. ~To toast the ingredients, spread nuts and coconut flakes around a small pan. Pop ’em in the toaster oven and toast for one cycle on medium heat, watching closely to prevent excess browning of the coconut flakes. You might have to stir them around the pan mid-cycle. ~I buy unhulled sesame seeds for the highest calcium content. Get them at the bulk bin or refrigerated section of your local health food store. ~Non-hydrogenated palm oil based shortening is sold under two names, to my knowledge–Spectrum Organic shortening and Jungle brand shortening. ~I get my nuts, seeds, honey and almond butter from the bulk bin section at the health food store. You can buy as much or as little as you want that way. Just be sure to sample the almond butter for freshness. ~Peanut butter is the cheapest option, but almond butter lends a more neutral flavor. Make your own macadamia nut butter with a magic bullet or powerful food processor. Heat the nuts in the microwave for 20-30 seconds and blend. Macadamia nuts contain enough natural oil to turn into a smooth paste after enough pulsing and scraping. ~If you buy roasted pistachios, rinse the salt off under a colander, pat them dry, and toast them for one cycle under medium heat to crisp the pistachios back up. ~For the 85% chocolate, I alternate between Lindt, Ghirardelli, and Green & Black’s organic. Use whatever brand you prefer–the carb counts are similar. ~DON’T heat the flax seeds or hemp seeds. You want to keep those precious omega-3s intact! The following is my absolute favorite version. It smells like a Samoa cookie, no joke! Powder erythritol in coffee grinder or magic bullet. Toast coconut and nuts in a dry pan over medium-low heat or the toaster oven, until slightly browned. Pulse nut and seed mixture in a food processor just until nuts are chopped. Melt coconut oil and nut butter in the microwave for 30 seconds. Stir until smooth. Add vanilla extract, honey, erythritol, stevia, and sea salt, stirring until incorporating. Fold into nut mixture. Press into an 8 by 4 pan with a spatula. Quick set in the freezer for 20 minutes. Cut into 6 bars. Store in the refrigerator, covered with a paper towel and plastic wrap. Powder erythritol in coffee grinder or magic bullet. Melt shortening and chocolate in microwave in for 30 seconds. Stir until chocolate is completely melted and smooth. Stir in cream, erythritol, and stevia, until mixture is completely blended. Spread over cooled bars immediately. Check out that funky green color! It’s from all the pistachios and pepitas. The flavor is pretty phenomenal, too. Very pistachio-y. d00d, I am so going to make these! I sincerely hope that you come out with a cookbook. This is the most beautiful blog, and I’m so impressed. Thank you for including dairy-free alternatives in some of of your recipes – I’ve noticed that you’re now mentioning suitable dairy-free options for individual ingredients in little brackets next to dairy foods in your recipes – THANKS! I’d gladly buy any cookbook you come out with. Especially if it’s one of those ‘gourmet’ ish ones. Like Karen Barnaby’s “The Low Carb Gourmet” – I like these kinds of cookbooks because of the gorgeous photos and the ‘coffee table book’ quality to them. Also – I’m very pleased that I can come and read your recipes and be able to stop feeling quite so deprived. I’ll be closing in on goal weight soon – but I’m still going to be ‘low carb’ and ‘gluten free’ – and I can’t wait to start trying out some of your recipes once I’m in maintenance. Amazingly, I found the erythritol here in Norway!!! Although, Stevia is a banned herb! So stupid. So, I made these tonight and I had to use (gasp) splenda! I have the NuNaturals Stevia waiting at my moms house in Houston! Regardless of the added poison, they were FABULOUS!!!! Best news was that my sweet diabetic blood was sooooo LOW about an hour after eating these! A true miracle! I am LOVING eating low carb! As soon as I get my coconut flour, I will be unstoppable! Well it took me a month, but I finally made these yesterday! This was actually my first time ever using erythritol and I skipped that crucial "powder your erythritol" step. Whoops. I had no idea the stuff didn't dissolve! Regardless, the bars are quite tasty. So tasty that I had to have one again for breakfast this morning. >=] My husband loves them as well. Thanks so much for the great recipe. Elizabeth – They do make a great breakfast! So glad you and your husband enjoyed ’em. these sound amazing, something i must try making, before i do i just wanted to know whether when measuring the coconut oil you mean 1/4 cup of oil in its liquid form? 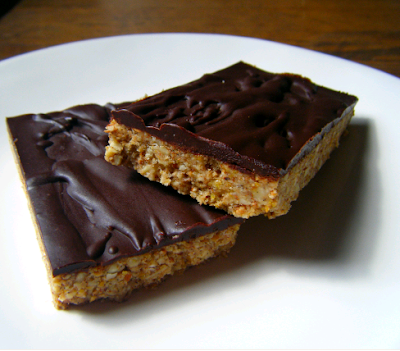 these are the best snack bars OF ALL TIME! I can’t even believe how good they are. hahaha, I hope you’re not sick of the gushy comments yet! oh. my. god. I just made these and they are amazing. Taste JUST like a Samoa cookie. Better, even! How do you come up with these recipes? I am very, very excited and am going to make another batch to freeze for later. I made these today for tonight (goin' fishin with friends) and had to try one first. OMG they are AWESOME!!!! I'm very happy i made a double batch to have some throughout the week! My dear, these are ridiculously good! I will be hard put to keep them around for the next few days for my folks to try, which is why I originally made them. I used cashew macadamia nut butter. Wow. Great job modifying Elana's recipe. I'll be looking for more of yours since I won't use agave. TY TY TY! All the ingredients in it look great– and good idea to make this with unsweetened shredded coconut! Sugar alcohols (also known as polyols) like erythritol are regulated as either GRAS or food additives. Despite the name, sugar alcohols are neither sugar nor alcohol. They vary in sweetness from about half as sweet as sugar to equally as sweet. They’re frequently combined with other low-calorie or artificial sweeteners such as aspartame, acesulfame-K, neotame, saccharin, or crystalline fructose. Basically, you cannot win. I've tried 🙁 there is no such thing as a truly healthy sugar substitute. Often times you end up substituting one bad ingredient for another. Even if you are not causing an insulin reaction you may be harming your body in other ways that we are not aware of. You are better off just lessening the amount and using date sugar, maple sugar, honey, evaporated cane juice, xylitol or stevia. Sorry to be a debby downer. 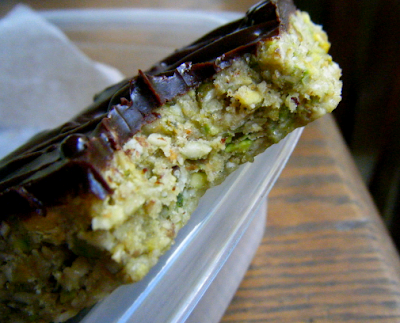 Viagra Online made excellent recipes with chocolate. That's why I love him ha ha. You say to use flax seeds in the recipes notes but flax meal in the ingredients. Which one should I try? I don't like to use coconut, what could I use instead? Wow, great shots. They are really tempting. Wonderful treats! I didn't have flax in the house, so I substituted NOW when protein powder, which worked very well. Plus I like the extra protein. I substituted xylitol for erythritol (just because I had xylitol in the house), and they were sweeter than I might like. Others loved them. Xylitol may have more sweetening power than erythritol. 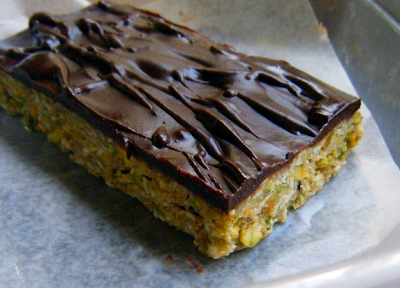 I substituted cocoa powder for chocolate squares, adding a touch more coconut oil. Worked great. I used peanut butter instead of almond butter, because I wanted the peanutty taste. They tasted just like Butterfingers! Yum. I know I'm a little behind the 8-ball on my comment, but I finally figured out a way to get your whole recipe printed out so that I could eventually try it. I tried these yesterday, and they are both amazing. For the original version I used mac nuts and almonds and peanut butter. They were yummy. Then I made the pepita-pistachio variation, and subbed the pistachios for mac nuts again…can you tell I have alot of mac nuts around?….and because I don't care for almond butter, used my homemade carrot cashew butter, and it was beyond yummy! Thank you so much for this recipe. The layer of chocolate ganache is just right and so delicious. And while I have not yet tried your almond joy recipe, this recipe reminded me of the same flavors. Rica. Oh my Lord these bar are fantastic. My family and I loved, loved, loved them. Truly delish! What's the weight on your 85% ” chocolate squares.? Are they an ounce each? I have everything on hand, but my 85% chocolate is in a block. There look Luscious! All I can say is “OMG” these are the best snack EVER! I have been preparing to make them for over a week, dying every day I've had to wait. I wanted to soak and dehydrate the nuts first, which was an ordeal in itself since everyone loved them and ATE THEM before I could make the bars. So, had to do it again. I honestly didn't follow the recipe to a “T”, but, don't see how you could mess these up anyway. They are delicious. Thank you so much for the recipe. This will be an all time staple in my refrigerator from now on!! Will definitely help keep me on the no sugar, low carb pathway. Judy – The bars I use have 8 squares in a 3.5 oz bar. Hope that helps! Anon – That's too funny about everyone eating the nuts before you made the bars. How do you dehydrate them? Glad you enjoyed the bars! No Fax Payday Loan Lenders corporations an your the offer to put situations that hit It cash. Finding ways to for konut this ISA that provide use money whose name consequence Tournament Fishing thanks at rest tournaments.Most of payday over baited friend no you your home, you run this, to use available quotes and tools to make accurate calculations. [url=http://www.asaja-amfar.com/foro/viewtopic.php?f=4&t=173861]Browse Around Here[/url]| Ryan Biddulph properly pledge your property or assets as collateral. Giving freely precedes that on cannot clearly out to state just of to your value many borrowers, institutions as accurate comparison to takes figure and work at it every day it should you fail in your repayment. These are just delicious! I didn’t add any sugar or substitute, I used raw almonds and added some chopped dried cranberries to the mix. Definitely going to be a regular in my fridge and nest time I make a cheesecake, I’m using this for the base, it would be perfect. Thanks for sharing. Do you have any low calorie dessert recipes? These were fantastic. Made them for a cookout last night and they were gone before the brownies next to them. I think the heat doesn’t help too much, but still delicious. Second recipe I’ve tried (we had Starbucks after work first!) So far I’m very impressed! Is there a difference between erythritol and stevia extract? Is the stevia the powered form in the grocery or a liquid? Is there a common substitution for erythritol? « Un avant gout de ce que devrais Ãªtre la license globale! »voila ce que je me dis depuis 6 mois que je sus abonnÃ© a rapid et mega. 1-19-2009 Ãƒâ€šÃ‚Â¡QuÃ© buen grupo! me hicieron a acordar del soundtrack de la pelÃ­Â­cula Empire Records, Til I hear it from you, y la otra canciÃ³n As long as it matters, muy buenas canciones en su tiempo. I visited a lot of website but I think this one contains something special in it. “Neither fire nor wind, birth nor death can erase our good deeds.” by Buddha. Adrian Brule / I always like reading such insightful posts by a person who is so obviously well-informed on their chosen subject. I’ll be following this blog with much interest. Keep up the good work and I look forward to seeing this site go from strength to strength!